A real Planet of the Apes? (NaturalNews) One hundred and fifty animal-human hybrid embryos have been produced by mad scientists in the UK — with full government approval — under the 2008 Human Fertilisation Embryology Act. 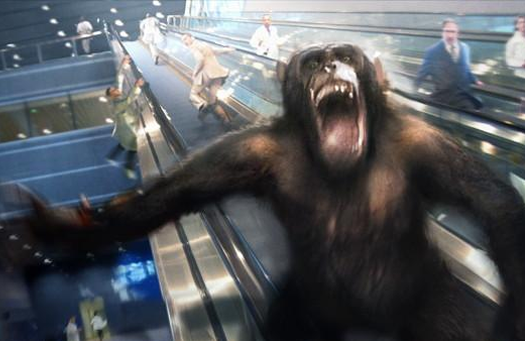 The UK’s Daily Mail newspaper is reporting that a committee of scientists recently blew the whistle on the operation and expressed alarm over the possibility of the experiments going “too far” and resulting in a real Planet of the Apes scenario, where animals escape from the lab and begin reproducing in the wild. Sound like science fiction? It’s actually just an extension of science fact: human-animal hybrids have been produced by these UK scientists for the last three years. Among the monstrosities they created were animal eggs fertilized with human sperm, and cybrids — animal cells that are injected with human cell nuclei. They also created chimeras, a mixture of human cells and animal cells, much like what happened in the sci-fi Planet of the Apes depiction of science gone wrong. It has not yet been revealed which animals were used in the chimera and cybrids, but it’s almost certain that they were mammals. Furthermore, the closer the genetic code of the animals to humans, the more likely the embryos would be viable, so it seems likely that these mad scientists would have been using eggs from monkeys or apes combined with humans. Planet of the Apes suddenly doesn’t seem so far-fetched, does it? None of these embryos were allowed to grow into fetuses, by the way. Current UK law requires them to be destroyed after 14 days. But that’s only the law. Who knows what kind of mad science is being conducted in the basement of corporate laboratories, away from the view of UK regulators and well outside the bounds of the law. For all we know, there could be a lab of half-apes living in laboratory cages right now, being studied in the name of “science” while plotting their own escape. Numerous animals around the world, by the way, have recently gained awareness and actively escaped their captors (http://www.naturalnews.com/032909_z…). Three laboratories in the UK were granted government licenses to play God with these human-animal embryos: King’s College London, Newcastle University and Warwick University. But what was the point of all this monkeying around with cross-species embryos? The scientists claim it was to developing embronic stem cells that would be used to “treat incurable diseases.” Yeah, right. What they really mean is that they would raise a secret lab full of half-human apes imprisoned in cages, then HARVEST their cells and sell them off to pharmaceutical companies which turn around and offer them to patients at a hundred thousand dollars per treatment. As usual, it’s just another way to exploit living organisms (and put animals through medical hell) in order to make a buck. Many people don’t know it, but even today, entire rooms full of primates in cages are used to grow viral material that’s harvested from their organs and blended with toxic chemicals to make vaccines. (http://www.naturalnews.tv/v.asp?v=4…) The vaccine industry won’t reveal this dirty little secret, of course, because it’s all utterly inhumane (and downright gross). But now the mad scientists are playing around with half human embryos that could theoretically be used to grow ape men which are half ape and half human. That the UK “scientific” community is dabbling in such dark arts is, of course, shocking to many people. Although you might expect such activities to be taking place in nations like North Korea or China, where the black market harvesting of human organs is an everyday event, few people expect UK scientists to engage in such “Island of Dr. Moreau” types of scientific treachery. But that’s only because those people don’t know what UK scientists are really capable of (or U.S. scientists, for that matter). Throughout the scientific community, ethical boundaries have been obliterated in the quest for profits. As long as there’s money on the table, it seems, no violation of nature, God or just plain common sense will stand in the way of a group of (government-sanctioned!) mad scientists trying to feed their maniacal egos. What’s clear is that medical “science” respects no ethical boundaries and routinely tries to play God with genes, seeds and medicines in order to make more money — all while putting the entire planet at risk from a runaway organism that escapes from the labs. This is really powerful. I watched it some time ago, but got refreshed after watching it again. Timely too. This morning I was in a class and the discussion there was on the same topic, more or less. I find this very good to share with students. Bodily Exercise, when compulsory, does no harm to the body; but knowledge which is acquired under compulsion obtains no hold on the mind.